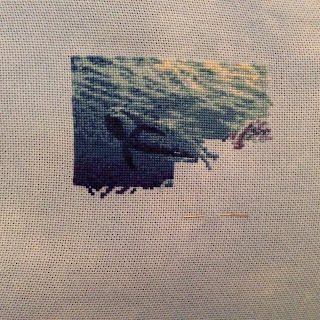 StitchyDonDesigns: Making Progress and Dreaming of Stitching !!! I'm in work right now dreaming of stitching! I'm on my lunch break so I thought I would post some progress. I'm working full time this week so not as much progress as normal but I'm over halfway through this page and on my second row of my aim for March. It's weird focussing on one project solely, I'm not used to it anymore but this project has been a lingerer for so long I want to work on it !!! You need to get stitching on that piece - right now! It's gorgeous. So hard to be in work and dreaming of stitching. I do it every day! It's looking wonderful, no wonder you want to finish it! Isn't work annoying that it takes time away from stitching. Enjoy your lunch and stitching.